Home/Nutrition & Recipes/Articles/Infant & Toddler Nutrition/Bottle Feeding/Milk. The baby formula milk debate: cow milk, goat milk or soy milk? When it comes to the best milk formula for babies, it seems everyone has a different opinion. With options like soy milk and goat’s milk readily available, working out which one’s the best for your child can feel like a challenge. As a parent, you’ll want the best possible option for your baby, and getting informed about the different aspects involved when making a choice is the first step. At Bellamy’s Organic we’ve done the research for you to give you an overview of the different types of milk suggested for children. The World Health Organisation (WHO) recommends feeding babies only breast milk until they’re six months old. Thereafter they should be given complimentary foods and continue breastfeeding up to the age of 2 years or beyond. When infants are not breastfed, infant formula is the only suitable and safe alternative. This includes dairy-based organic infant formulas, such as the Bellamy’s Organic Infant Formula range. Cow’s milk-based formula is suitable for most healthy full-term infants and is recommended over formulas made from soybeans, or modified lactose formula. Dairy-based infant formulas are designed to mimic mother’s milk closely and can be used from birth. Since cow’s milk formulas are supplemented with all the necessary nutritional components for infant growth and development, especially iron, they are safe for your baby. However, fresh cow’s milk should not be offered to your baby until they are 12 months or older. Fresh cow’s milk should only be given to children after this stage as cow’s milk is not as easily digested and contains low iron levels. Furthermore, unmodified cow’s milk is high in protein and electrolytes which can not be filtered by young kidney’s. Once your baby hits the one-year mark and if you chose to wean them, you could start giving them some cow’s milk as they will be meeting their iron requirements through complimentary foods and they’re kidney’s will be more developed. Compared to cow’s milk formulas, there have been fewer studies completed to assess the safety and efficacy of goat’s milk formulas. Many infants who may be allergic to cow’s milk are also allergic to goat’s milk. The use of goat’s milk formula is noted as generally being at higher end of the acceptable protein range as it contains higher levels of protein than cow’s milk, however in Australia, as noted by the Infant feeding guidelines developed by the national health and Medical Research Council, a range of cow’s milk and goat’s milk formulas that meet the Australia New Zealand Food Standards Code for infant formula are available. There is little evidence that, if breastfeeding is discontinued for any reason, one formula is better than another for healthy full-term infants. If your baby is allergic or intolerant to dairy, you might be looking for alternatives to cow’s milk or dairy-based infant formulas. Many infants who are allergic to cow’s milk are also allergic to soy drinks. Soy is sometimes suggested as a suitable dairy alternative and is sometimes raised as an option for avoiding allergies such as eczema, hayfever, or asthma in children. However, the Royal Australasian College of Physicians notes soy-based infant formulas have not been demonstrated to be effective at preventing these and could even worsen the condition if used for extended periods. Soy formula should only be used if recommended by your GP. It’s best to feed babies mother’s milk however, infant formulas are a safe and nutritious alternative if mother’s milk isn’t available. As always, ask for your doctor’s advice on a suitable product specifically for the needs of your child. Choosing an organic infant formula will minimise exposure to artificial pesticides, antibiotics or fertilisers. Get your doctor’s advice on a suitable product if you have any doubts. 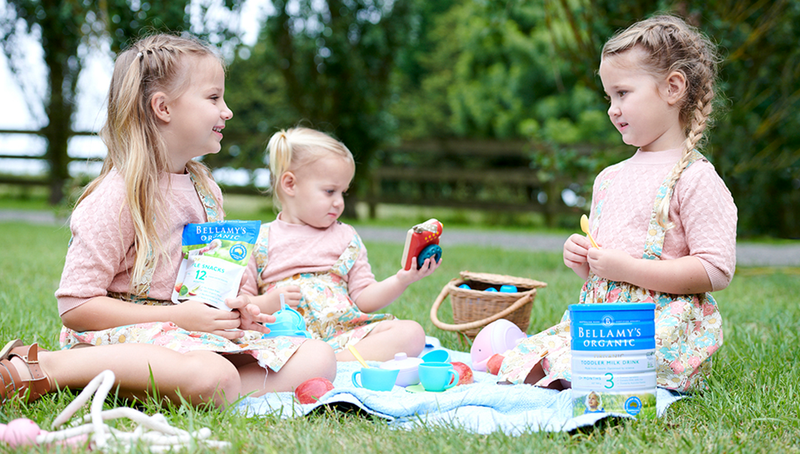 Bellamy’s Organic is dedicated to providing wholesome, nutritious, organic foods for babies, toddlers, and children. Our Australian-made baby formulas are certified organic, giving your child a pure start to life. To find out more about our products, please feel free to explore our website or contact us directly for more information.